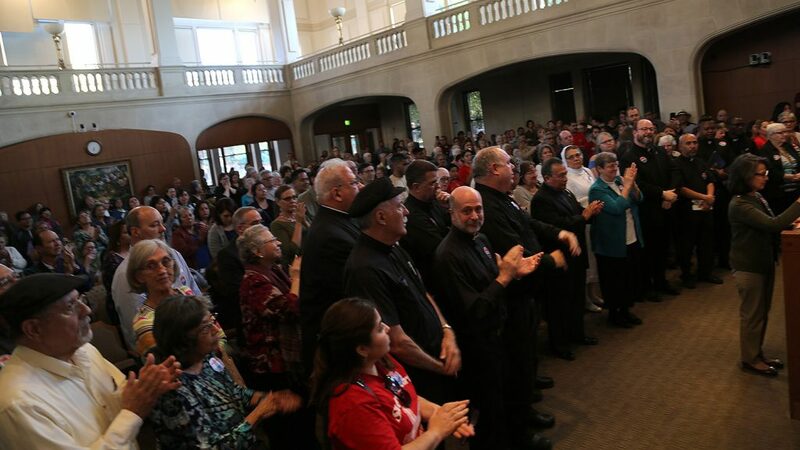 COPS/Metro leader Maria Tijerina uttered those words as she, along with Archbishop Gustavo García-Siller of the Archdiocese of San Antonio, addressed the council on behalf of the throng, many of whom represented Sacred Heart Catholic Church on the West Side and St. Patrick’s Catholic Church in Government Hill. “We hear you loud and clear,” Mayor Ron Nirenberg said. COPS/Metro was joined by the San Antonio Housing Oversight Coalition, and other concerned citizens, the night before the City Council is scheduled to vote Thursday morning on components of a larger displacement policy. A study on displacement in San Antonio, which would examine root causes, was scheduled to begin in late 2020. But pressure COPS/Metro has applied to Nirenberg, the council and top city officials since December, when the council approved changes to the downtown housing incentive policy, has pushed the city to accelerate the study to begin ASAP. However, the 12-18 month timetable for its completion does not compute with the community organizing group. Nearly all attendees stood as García-Siller told Nirenberg and the council that developing a displacement prevention policy shouldn’t have to wait on a study to be completed. 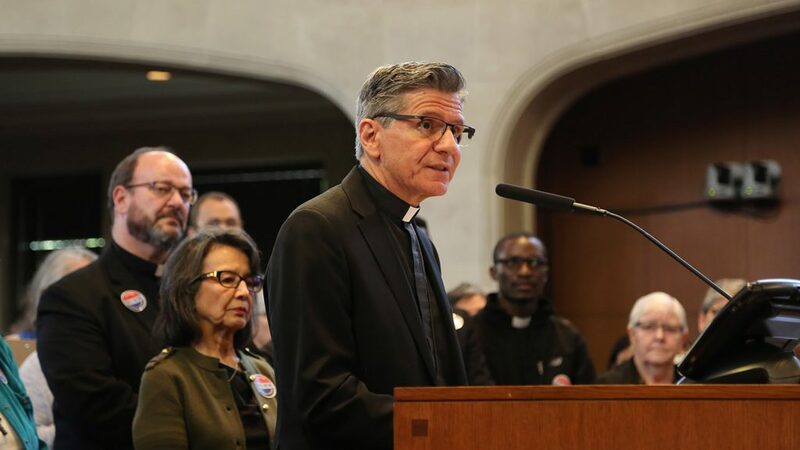 The prelate spoke with a sense of urgency, saying he supports the University of Texas at San Antonio’s downtown campus expansion, but was concerned for the West Side residents it could potentially impact. “They have lived simply, and with pride, in their homes, which have belonged in their families for decades,” García-Siller said. He said parishioners have told him about their property values increasing, and about threats of code compliance violations from real estate speculators who are pressuring them to sell their homes. García-Siller said the city gives incentives—tax rebates and fee waivers—to developers while homeowners who improve their own homes see their taxes rise. Tijerina, who followed García-Silla, said previous studies conducted by the city, such as the vulnerable neighborhood analysis by the National Association of Latino Community Asset Builders, and recommendations made in the Mayor’s Housing Policy Task Force report, were enough to develop a displacement prevention plan now. Rather than conduct a study on the root causes of displacement, which the council’s Comprehensive Plan Committee had endorsed in a meeting Wednesday morning, Tijerina said the city should consider COPS/Metro’s own recommendations, which are based on a report from the University of Texas at Austin on displacement in Austin’s neighborhoods. As part of its larger displacement strategy, the city is pursuing some of the recommendations, including offering a homestead tax exemption on the city portion of the property tax bill. As COPS/Metro members left the chambers, they gathered around Walker Moore, a COPS/Metro Alliance organizer, in Main Plaza. “When you want to slow something down, what do you ask for?” Moore asked the crowd. “We’re here to fight for the families (being displaced),” said Lupita Valdez, a COPS/Metro Alliance leader and Sacred Heart church member. “It’s certainly a neighborhood justice issue, where the people are being priced out of their homes, their long-time homes,” said Edna Molina, a member of COPS/Metro and of Our Lady of Guadalupe Catholic Church in Helotes. Back inside the chambers, members of the San Antonio Housing Oversight Coalition (SAHOC) told the council the $1 million risk mitigation policy, which the council will vote on Thursday, needed developers and property owners to contribute more to residents they could potentially displace, more educational resources for tenants, and to increase displacement funding in next year’s budget. The risk mitigation policy, which has been in the works since October, helps people who are being kicked out of their home, or who are on the verge of losing their housing. SAHOC member Jessica O. Guerrero said the policy “misses some critical opportunities” to be effective otherwise. Maureen Galindo, a former resident of the Soap Factory apartment complex in west downtown, said the risk mitigation policy should be provided to Soap Factory residents, who she says are experiencing abusive apartment management, and rent and fee increases they can’t afford. She said the policy could be tracked as its being used by Soap Factory residents. In attendance was a current resident of Soap Factory, Sonia Preston, who has lived in her one-bedroom overlooking San Pedro Creek since August 2017. She attended the council meeting, curious to see if anything discussed could assist her own housing situation. In a week, she’ll be moving back to North Carolina, where her family lives, after being charged extra fees from Soap Factory. She was given an ultimatum by the Soap Factory apartment manager, Preston said, between signing a more expensive lease for an efficiency apartment, or adding $300 to her $590 rent for a month-to-month lease. Her $10-an-hour income at Macy’s would not support the rental increase, she said. Since then, she hasn’t been able to contact Soap Factory’s management about her lease. COPS/Metro Alliance will hold an accountability session on April 7 with Nirenberg to discuss displacement prevention at St. Patrick’s Catholic Church in Government Hill. I’ve said much of this through these past years.I unfortunately missed the this Citizens to be heard to Block Walk because I’m a Mayoral Candidate and the only candidate that will help our people from being displaced. The developers get tax breaks and make profit off of displacement and gentrification. Why are tax payers paying for their greed? All displacement costs should be paid for by the developers! Time to displace and replace Mayor Ron Nirenberg and the city council members running for re-election. This mayor and council just do not care. We do not need represents that leave citizens high and dry. The problem is greed and city hall insiders, developers and their lobbyists controlling city hall and city hall care more about them that our citizens. Come out and vote against these sellouts.